Traveling through India at the moment, the enchanting chaos that strangely touches the deepest stillness within me that I keep on returning to year after year. It is much harder work than a holiday, but my curious and adventurous nature keeps me moving through this land rich in history, culture and myth, and the sacrifice is always worth it. Rickshaws, trains, bumpy roads, and a heavy backpack, all make an impact on my back, and really has me missing my aerial hammock. Headstands help, but are not quite the same.. the feeling of hanging from my ankles or hips, and allowing my whole body to lengthen and decompress is like no other. There is more to hanging upside down though than the amazing physical effect of decompression, lengthening and blood flow towards the head. 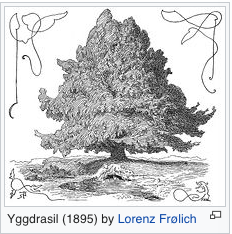 In Norse mythology, the head-god Odin hung from Yggdrasil, the Tree of Life, for nine days in order to gain the insight into the mystical Runes. Hanging one from a tree, historically was a sign of dishonor, and Odin’s action to hang himself clearly signifies the sacrifice of ego in order to open the way for his rebirth into spirit. By sacrificing one eye he is releasing his attachment to the intellect and allowing the all-knowing eye to awaken. Hanging upside down also represents a reversal of values of ego and the material world and an acceptance of the values and laws of the inner world. We can look to our experience to find that this holds true. For a novice there is a lot to give up and surrender in the simple act of hanging. One needs to give up their need for control, put their trust into the teacher and the hammock, and find a comfortable place only by complete surrender. For more experienced practitioners it is a favored practice as it opens one’s mind, widens perspectives and deeply humbles the hanged one. It is believed that the sacrifice of Odin inspired the Tarot card of the Hanged Man. This major arcana card is the only one based on a mythological figure and holds an important place in the Tarot deck. It is card numbered 12, a sacred number representing the coming together of oneness and duality, and emerging of a new perspective. The card depicts a man with his hands tied behind his back, hanging by one of his feet from a tree. He is pictured as smiling, his face serene, with a halo around his head, despite his obviously uncomfortable position. Just like Odin, the Hanged Man is in a state of vulnerability, solitude and submission to divine will, which is exactly what brings him strength and mystical knowledge. 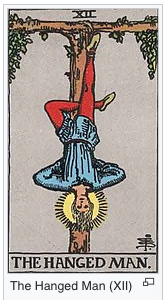 The Hanged Man’s guidance and meaning is amongst the most mysterious and paradoxical of all Tarot cards, yet the most enlightening as they cannot be learned by the ways of the ego, but only by looking within. He hangs between two worlds: the physical world or the world of the ego, and the unknown, spiritual world, the one where our shadow lies. Many times in our lives we are faced with situations where we feel stuck in limbo. Accessing the spiritual world and facing our shadow means that we need to be willing to be vulnerable, exposed, to let go of attachments to our beliefs, and often to let go of everything we previously knew. We also need faith and courage to step into the unknown. The Hanged Man takes time to dive within, learn the lessons, and embrace the shadow as the only way of being blessed with ecstasy and new beginning. Surrendering to the situation and making use of it is the only way to get through it. Swimming upstream prolongs our time in limbo and causes misery. As the card of the paradox, the Hanged Man also urges us to look at things in a new and different way. Being vulnerable brings one strength. Courage is admitting you are afraid. By giving up control, things start flowing in a desirable direction. Sometimes staying still is the only way to move forward. Just like Odin’s and the Hanged Man’s sacrifice, our choices in life inevitably come with sacrifices. Choosing to enter a relationship means a sacrifice of one’s solitude. Choosing travel and adventure means a sacrifice of home base and routine. Our choices bring us happiness only if we are ready to sacrifice that which we don’t choose. In situations we have no control over it is best to learn to go with the flow. The hustle and bustle of Vrindavan brings me back from my daydream as our Rickshaw driver beeps the horn to a herd of cows, leisurely taking over the road. I spot a monkey hanging from a tree but quickly moving on to another branch, taking different position. When we can get our monkey mind to settle and hold our hanged inversion a little longer, perhaps we can remember the mythical hanged man and meditate on his symbolism; pause.., take a few deeper breaths, humbly surrender, find deeper layers of relaxation, shift our perception, and allow for mystical knowledge to dawn. 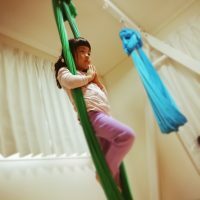 Tanya Popovich is an Unnata Aerial Yoga® Course Leader, since 2014. 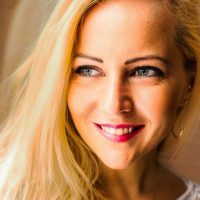 She is the co-founder and director of Swaha Yoga Center in Athens, Greece, is a certified Jivamukti Yoga teacher, and Yoga Acharya in Sivananda tradition. 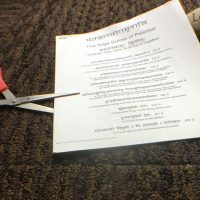 Tanya studied alignment and bio-mechanics of the body through Anusara Yoga, having completed the immersions, teacher training and Yoga Therapeutics. Such a profound expression of the sacred experience of hanging upside down! So that’s why we love it so!! !